Late last year we took a look at CedarWorks' Rhapsody collection, a beautifully designed line of playsets and playhouses especially made for indoor active play. 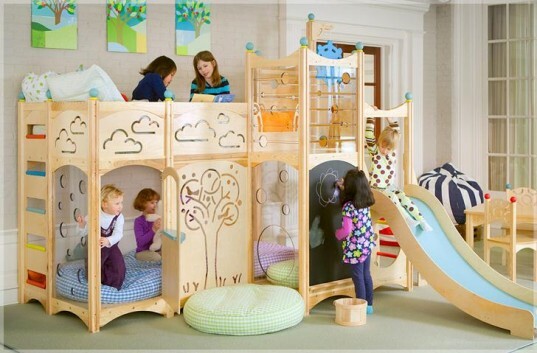 CedarWorks Rhapsody collection expands beyond indoor play areas as well. 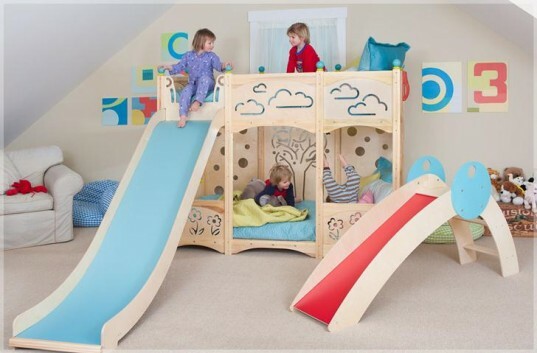 The line also includes many attractive and magical Playbed options! 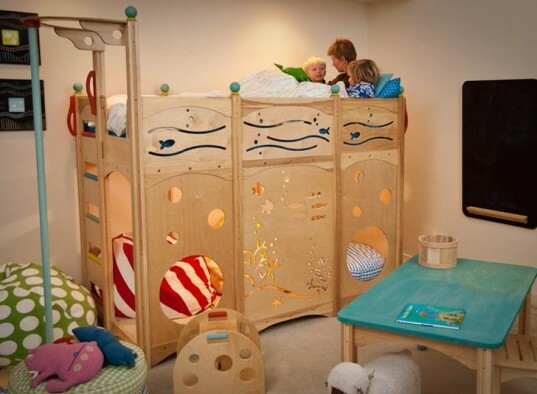 These bunk beds and loft beds for kids not only inspire sleep, they promote active, healthy playtime as well. Now when you say, "Time for bed!" there won't be any whining, because a Rhapsody bed is what dreams are made of! All Rhapsody beds and lofts are made safely with furniture grade solid hardwoods and premium multi-ply Baltic Birch laminated panels. Naturally colored pieces in the collection are finished only with water-based stains for very low VOC emissions. Colored furniture components are finished with child-safe stains that perform well below state and federal VOC emissions regulations. All Rhapsody furniture contains zero plastic components, which means it’s easier to recycle at the end of its lifespan. These beds are more tiny works of architectural art than simply furniture. With beautiful and imaginative extras available like tree, swirl, clouds or ocean cut-outs, pops of color here and there, windows and plenty of extra space options, (such as tuck away shelving), these beds are useful, lovely, creative and will look amazing in any modern home. Plus, Rhapsody playbeds are modular so you can add on or change things around over time if needed. 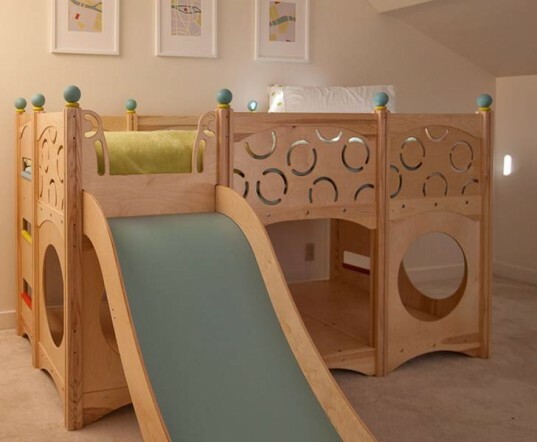 CedarWorks notes that most children can begin to navigate Rhapsody playsets or beds as early as 12 months by crawling in and out of nook panels or up and down ramps. By 2 years old, most children can enjoy almost all Rhapsody accessories. These beds are made with child safety in mind, yet are designed strong enough to hold the weight of an adult. Additionally, these beds are made with perks like mortise-and-tenon joinery, post-and-beam construction, weight bearing braces and over-sized timbers which not only add to the safety but ensure your bed will last years and years, no matter what your child dishes out. 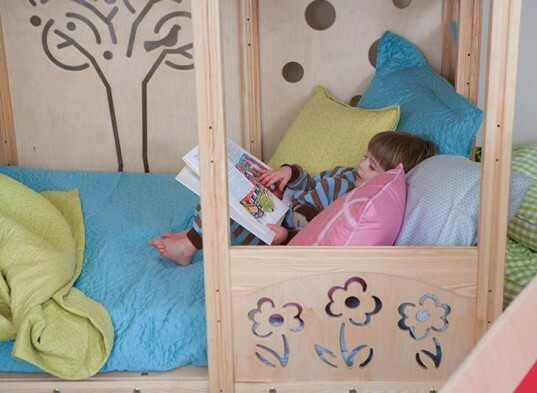 What kid wouldn’t want a bed with a slide, a sliding pole, steering wheel, telescope or hide-away spaces? These are beds that make it fun, not a chore, to drift off to dreamland. CedarWorks’ ReCedaring program has donated more than 450,000 seedlings to small woodlot owners and environmental organizations. Additionally, this company donates 10% of profits to organizations and programs that benefit kids and the environment. With Rhapsody, the sky is the limit when it comes to personalized designs. You can work with a CedarWorks design expert who can help you design a bed perfect for your child, or even design your own. 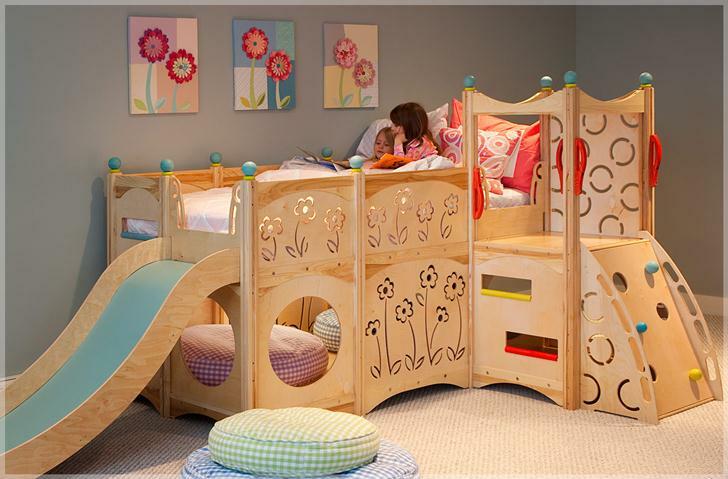 Because CedarWorks strives to offer personalized options, there are infinite ways you can create a bed that truly fits your child and your space. Hi, I am Amely from Malaysia, Seremban. Hi, my house kids super like the design of this bed. I wish to order 1 set for my kid's birthday present, so can i know the price for this. Hi. I am at London and am looking for beds for my kids. This collection looks brilliant but I don't know if you deliver to uk, too. If delivered, price as well. I will look forward to hearing from you soon. Please contact Cedarworks directly. We simply featured their designs here, but you'd have to buy from them. All Rhapsody beds and lofts are made safely with furniture grade solid hardwoods and premium multi-ply Baltic Birch laminated panels. Naturally colored pieces in the collection are finished only with water-based stains for very low VOC emissions. Colored furniture components are finished with child-safe stains that perform well below state and federal VOC emissions regulations. All Rhapsody furniture contains zero plastic components, which means it's easier to recycle at the end of its lifespan. 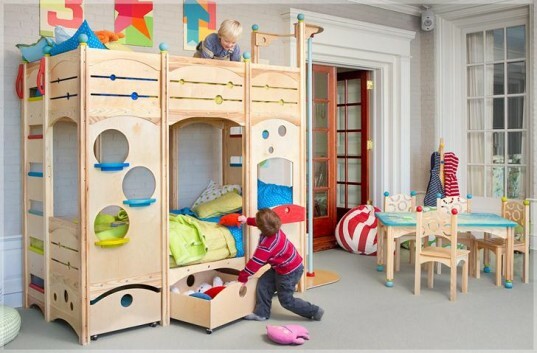 What kid wouldn't want a bed with a slide, a sliding pole, steering wheel, telescope or hide-away spaces? These are beds that make it fun, not a chore, to drift off to dreamland. CedarWorks' ReCedaring program has donated more than 450,000 seedlings to small woodlot owners and environmental organizations. Additionally, this company donates 10% of profits to organizations and programs that benefit kids and the environment.